China aims to establish a large manned space station within the next decade, officials have said, and the latest reports suggest that this outpost could host not only Chinese astronauts, but European spaceflyers as well. A plan is afoot for China and Europe to cooperate on the venture, which might see the European Space Agency (ESA) building technologies, including a rendezvous and docking system, for the station, in exchange for opportunities for its astronauts to visit the facility. China plans to have the space station running by 2020. Both the station and China's manned spacecraft Shenzhou could use ESA's International Berthing and Docking Mechanism (IBDM), because of a problem with the Russian system the Chinese have been using until now. 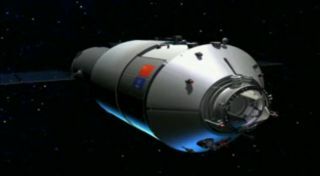 An unmanned Shenzhou spacecraft docked with Tiangong-1 for the first time in November 2011, and the docking mechanism didn't work exactly as planned, some say. "It was originally bouncing off," Bob Chesson, an ESA human spaceflight advisor, told SPACE.com. "Essentially they have to ram this [Shenzhou] thing in and they are very worried that if you assemble a station like that, you basically will have all sorts of structure fracture mechanics problems, that type of thing." The Shenzhou spacecraft is not heavy enough to activate the APAS docking system correctly, Chesson said, so it had to be rammed forcefully to make a connection. Chesson traveled to Beijing with ESA's director-general Jean-Jacques Dordain and talked with the China Manned Space Engineering Office. "Our director general has made some noises that he wants us to get involved with [the Chinese space station program]," Chesson said. "The Chinese, we had them over and showed them [the IBDM] and they were very interested because they are using the modified APAS system." To discuss whether the IBDM system might work better for the Chinese space station, ESA officials sponsored a working seminar to collaborate with Chinese space officials, Chesson said. Chesson has been a senior advisor to Thomas Reiter, the German-born former astronaut and head of ESA's human spaceflight directorate and operations. He spoke recently about the collaboration with China during a presentation to the Cambridge branch of the UK's Royal Aeronautical Society. The IBDM is system to allow different countries' spacecraft to dock and berth with each other, despite their different designs. Originally developed by ESA and NASA for the X-38 program, a prototype crewed spaceplane that was cancelled in 2002. The X-38, also known as the Crew Rescue Vehicle (CRV), would have allowed a seven-person International Space Station crew to escape the station. The US space agency ended its involvement in IBDM when the X-38 program ended. Now IBDM will form part of the ESA-China cooperation, as rendezvous and docking is one of three working groups set up by Chesson for collaboration between the two agencies. The other two working groups focus on crew training and the exchange of payload facilities and experiments. "Last November we had a delegation from the Chinese astronaut training center, they came over for a week at EAC [European Astronaut Centre in Cologne, Germany] and we explained to them how our training program works," Chesson said. That visit was preceded on Oct. 8, 2012 by the China Manned Space Agency's director general Wang Zhaoyao and the first Chinese female astronaut, Liu Yang, visiting Dordain, at ESA's Parisian headquarters. Yang was involved in the 2012 Shenzhou-9 mission that docked with Tiangong-1. Following these two visits, a delegation of ESA astronauts and trainers will be going to Beijing in April to see how the Chinese train their crews, Chesson said. With this growing relationship, ESA now offers introductory Chinese classes for its astronauts at the EAC. Frank De Winne, a Belgian-born astronaut and head of ESA's astronaut corps, confirmed to SPACE.com that an astronaut exchange program was ongoing. But: "No discussion has taken place as to a potential flight by a European astronaut on a specific Shenzhou capsule," he said. Joint astronaut training, Chinese lessons and Chesson's third working group, the exchange of payload facilities and experiments, all point to preparations for future missions for ESA crew on China's spacecraft. Chesson said that ESA is "seriously looking" at providing experiments for future Tiangong missions. De Winne told SPACE.com that European experiments on a Tiangong mission or the future Chinese space station will "depend on the ESA member states' decision as well as the Chinese disposition." The exchange of experiments could conceivably lead to Chinese science being carried out on the International Space Station by ESA astronauts. "For the moment, there are no specific experiments that have been identified," and any Chinese experiment on ISS "would have to first be discussed with the ISS partners," De Winne explained. ESA has a history of cooperating with China on Earth observation since the 1990s and, more recently, under the Dragon programs — joint ESA-China programs for Earth observation that have been ongoing since 2004. While ESA is forging ahead with Chinese cooperation, NASA is prohibited from engaging in bilateral cooperative activities with China or any Chinese owned companies, per a directive from Congress.